As is often the case with Shirley Jackson’s writing, there are two layers of horror at work in “The Daemon Lover”. The story is named after a Scottish ballad — one that tells the story of a mysterious man, James Harris, who returns to an old lover after a long absence and persuades her to come away with him, leaving her husband and child behind. It is, in sum, a story about women who stray from the path of normative social expectations. Jackson’s version, published in 1949, is not a retelling, but it makes very effective use of literary allusion: the protagonist, an unnamed woman in her thirties (thirty-four, though her marriage license says thirty), wakes up on the day of her wedding to a man named Jamie Harris and drinks cup after cup of coffee until it’s time to get ready. However, as the hours pass it becomes obvious that her mysterious fiancé isn’t going to turn up. We then follow her as she leaves the house and asks about Jamie Harris, trying to resolve a possible misunderstanding about where they were supposed to meet, until we reach an ending where “no matter how often or how firmly she knocked, no one ever came to the door” — a resonant image of exclusion that hints at the many ways unmarried women have been shut out of society. The first reason why “The Daemon Lover” is an effective horror story is that it does such an impressive job of evoking a state of mounting anxiety. From the first line — “She had not slept well” — we can tell that despite the appearance of normality the protagonist is in a state of considerable nerves. As the hours pass, we watch her slips into forced optimism and rationalisation, of the kind we cling to when we know admitting something’s wrong might very well undo us — especially as it becomes increasingly obvious that it is. “The Daemon Lover”, then, is a powerful study of subdued panic, of having your worst fears confirmed but delaying the moment when you acknowledge it because of everything it implies. It also captures the psychological harm inflicted by lack of clarity: it’s not just that Jamie Harris leaves; it’s that he doesn’t say he’s going and instead leaves her to piece this message together as the hours drag by on her wedding day. It’s important to add that her fears about the policemen’s potential ridicule are not unfounded: they come after the woman at Jamie’s building whose “voice sounded amused”, and the newsdealer whose “smile was knowing” and whose “eyes shifted over her shoulder to the man in back of her”. To describe the protagonist of “The Daemon Lover” as paranoid, then, would be gaslighting at its most insidious: her wariness is an all too human reaction to a social context that does mock women like her. Fear is an entirely appropriate response. Her counterarguments, the ones she can’t bring herself to make, are still ones that reduce her value to her ability to make a man happy, but that’s the point and the horror, really — the weight of patriarchal assumptions forces you to debate your humanity in their terms rather than your own. Trying to imagine a story like this with a straight male protagonist makes for an interesting thought experiment. Imagine all the tragic glamour we’d assign to a man searching for his missing bride; imagine the layer of romance that would permeate his hurt and confusion. Imagine, most of all, how the possibility of deliberate abandonment, hurtful though it might be, would never really call his humanity into question. He would have a right to walk the streets asking questions. He would be allowed to exist. It’s nothing like the thinly veiled scorn we reserve for women in the same position: a woman left by a man, or searching for a man who might not want to be found, is assumed to be desperate and pathetic. She becomes the punchline of a joke nobody is quite making but that is in everyone’s minds. The weight of all these dehumanising assumptions is what the protagonist of “The Daemon Lover” is up against — it is, again, the story’s real source of horror. “The Daemon Lover” is the kind of story I’ll always want to rewrite in my head, giving it an ending where the protagonist tells the policeman, the porter and the newsdealer “well, screw Jamie Harris and screw you too”. She then goes home and greatly enjoys having a cup of coffee on her own while reading the newspaper or a good book, before getting ready to go out with her friends in the evening. However, I appreciate that Jackson is writing about a world where such a simple, ordinary possibility is outside the imagining of a large portion of the world. This world is one where “chronically unmarried women have long endured the injustice of being set aside, ignored, dismissed, made invisible”. Defiance, small or large, is far more difficult in isolation, and “The Daemon Lover” is powerful because it shows us how patriarchy can get inside our heads and relentlessly assault our sense of worth. This post is my contribution to Shirley Jackson Reading Week, for which I have been a not very efficient co-host. Do stop by Simon and Jenny’s blogs for excellent posts and round-ups of what everyone has been reading. Links of interest: that one time I invited a bunch of friends over to talk about “The Lottery” (that was fun). This story is made all the more layered and interesting when you add the knowledge that Jackson's husband had (I think, many) affairs with his students. I didn't know that :/ I'd love to read a biography of hers, actually. The only biography of her that I've read is Private Demons by Judy Oppenheimer. It's been a long time since I read it and, to be honest, I don't recall being too impressed - but that might be because I found the entire thing so depressing! Thanks for this review, btw. by coincidence I found a copy of We Have Always Lived in the Castle yesterday and I bought it. Haven't read it in years and I'm very keen to reread! Happy re-reading! That's one of my absolute favourites. Also, I should read her own memoirs, Life Among the Savages and Raising Demons. They used to be hard to find, but now they've been reissued. I bet they reveal a lot. I read this yesterday, and yes, it's very unsettling, especially for the horror that lurks beneath the surface in the way everyone treats her. And then there's the way every choice she makes is governed by how other people will perceive her; she's bought into the whole system, which makes her desire to marry feel even more urgent. She's defining herself on their terms, as you say. It's also unsettling that, by the end, as she's knocking on that door and getting no response, we readers are placed on the side of those who disbelieve her, wondering if the lover was ever real after all or if she's merely delusional. Yes, I can see how we are, and the allusion to the ballad hints at that also - but at the same time I resisted that reading because of the long history of women being pathologised that also forms the story's backdrop. It's this tension that gives it much of its power, I think. Good to hear you're joining us, Mee! I need to read the whole of that collection - I've greatly enjoyed every story that I've read, but I've yet to read the whole thing back to back. Oh, it IS interesting to think what this story would look like if the protagonist were a man -- even a gay man, honestly! I think my mind would still jump to, Well something must have happened, rather than, He's been abandoned, poor thing. 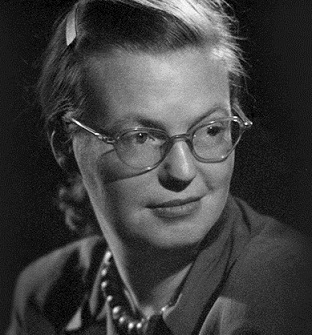 I know you're not supposed to think about the authors' lives when you're analyzing stories, but God do I think about Shirley Jackson when I'm reading her stories. All her women are so caged, if not physically then by expectation. It's so furious and despairing, always. I love her. "It's so furious and despairing, always." YEEEES, a thousand times this! I don't actually know much about her life, but between you and Celine I'm intrigued (even though it sounds super upsetting). I haven't read this story, but it as an awesome review. And thank you, thank you, thank you for linking to Briallen Hopper's piece on Bolick's Spinster book. It is exactly the kind of reflection on spinsterhood that I've been looking for. I had fortunately been warned off early from Bolick's book, and didn't read it. Hopper just really gets it. These lines were my favorite from Hopper's piece: "all too often female independence without the approval-stamp of male desire is seen as a source of shame, and is blamed on the spinster’s supposed spiritual or sexual frigidity, and/or her ugly or invisible body. Spinsterhood is commonly interpreted as a symptom of a guarded soul and hardened heart." You're welcome! I found it on Twitter via Sarah McCarry (amazing writer) and I'll usually read anything she points to. Then I realised I'd read other Briallen Hopper pieces before and really enjoyed them - she's someone whose writing I definitely want to follow. Great post Ana. This sounds like another fascinating and sinister book I must read. It has been too long since I read my last Jackson novel. Fantastic review. I don't know why I keep postponing reading Shirley Jackson. I haven't read enough Jackson to know—does she often use allusions to build horror in her work? It's silly. 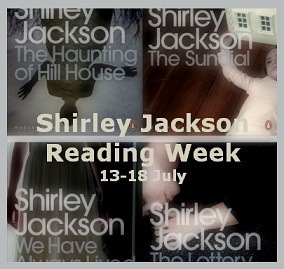 I always feel like yeah, I know Shirley Jackson, but I've only read We Have Always Lived in the Castle and The Lottery. She always seemed so self-contained to me as a writer. No, you're right - I think this one's an exception. I was surprised when I found out a) that there was a folk ballad and b) that there was a clear connection in the man's name, because that's not something I expected to find in her work. She uses it to great effect here, though (even if, as I was telling Teresa above, my default position here is to resist casting doubts on the protagonist). I need to read more Jackson. This post set me off in so many excellent directions, not the least of which were Hopper's and Kipnis's pieces on Spinster. Thanks so much! And, of course, the Jackson sounds excellent. I've only read Hill House and Castle, so I'd like to read more. I'm great fan of Shirley Jackson's writing. The Daemon Lover flows leading you until you realize there is no Jamie Harris. Then your mind suddenly says aha! I get it. Though only a short story its still very well written. The Lottery had the same effect on me. It certainly is one possibility, that there is no Jamie Harris. I'm inclined to interpret it the other way. He exists. He let her think they were getting married, for his own amusement. He ditched her without any note or notice, discarded her for the next adventure or woman because he never once cared. He is the daemon. She--insecure, vulnerable, self-conscious--bought his story because, despite all and any clues to his duplicity, she desperately wanted to. We get a glimpse of this uncertainty in her letter to her sister, where she alludes to a strange or awkward way she and Jamie met. It's part of SJ's brilliance that she doesn't spell that out but let's us wonder, while adding to the general unease.